Synthetic biology is a newly emerged research discipline that focuses on the engineering of novel cellular behaviors and functionalities through the creation of artificial gene circuits. One important class of synthetic circuits currently under active development concerns the programming of bacterial cellular communication and collective population-scale behaviors. Because of the ubiquity of cell-cell interactions within bacterial communities, having an ability of engineering these circuits is vital to programming robust cellular behaviors. Here, we highlight recent advances in communication-based synthetic gene circuits by first discussing natural communication systems and then surveying various functional engineered circuits, including those for population density control, temporal synchronization, spatial organization, and ecosystem formation. We conclude by summarizing recent advances, outlining existing challenges, and discussing potential applications and future opportunities. Synthetic biology is a newly emerged research discipline that focuses on the engineering of novel cellular behaviors and functionalities. Since the launch of the field in 2000 ,, a wide range of synthetic gene devices have been created, including switches -, oscillators -, memory elements ,,, and communication modules ,-, as well as other electronics-inspired genetic devices, such as digital logic gates -, pulse generators , and filters ,. With designed cellular behaviors and functionalities, engineered circuits have been exploited to understand biological questions and to address various real-world problems . The field has shown tremendous potential for biomedical, environmental, and energy-related applications . For example, towards biomedical applications, engineered genetic circuits contribute to the understanding of disease mechanisms, provide novel diagnostic tools, enable economic production of therapeutics, and enable the design of novel treatment strategies for various diseases including cancer, metabolic disorders, and infectious diseases ,. In the last few years, the advances of synthetic circuits have been further expedited, empowered by recent breakthroughs in genetic engineering techniques such as novel DNA assembly - and genome editing tools -, advances in methodologies including those for rational circuit design and optimization -, and quick enrichment of parts and elements ,. As a result, synthetic biologists are now in a position to engineer desired cellular phenotypes in a larger, faster, and cheaper fashion. One important class of synthetic circuits that are under active development concerns the programming of bacterial cell-cell communication and the group behaviors of communities -. Successful examples include gene constructs responsible for cellular density control , spatiotemporal patterning ,,,, and ecosystem formation ,. The engineering of community-based circuits is essential and invaluable towards the implementation of complex but robust cellular functionality because of the following reasons: First, although microbes are single cell organisms, they are present dominantly in the form of communities in nature and in live bodies, such as biofilms , and the human microbiome ,. Second, microbial physiology and functionality are strongly correlated with their forms - for instance, bacterial antibiotic resistance is distinct when cells are in planktonic forms and biofilm forms ,. Third, recent advances in the biotechnological industry have clearly shown that microbial consortia may provide many compelling advantages in producing products of interest and controlling fermentation processes ,. We are thus motivated in this article to overview the advances of synthetic gene circuits towards the programming of bacterial cellular communication and community behaviors. We will first discuss basic communication modules that confer cell-cell coordination in communities. We will then overview various functional gene circuits that enable the implementation of desired dynamic group behaviors, including those for population density control, temporal synchronization, spatial organization, and ecosystem formation. We will conclude by summarizing recent advances and discussing existing challenges, potential applications, and future opportunities. Although not discussed here, it is important to note that there has been considerable progress in developing synthetic cellular communication in eukaryotes such as mammalian cells and yeast, which has been surveyed in the literature ,,. Despite their species diversity, bacteria often utilize similar signaling systems for the implementation of their group behaviors ,. For instance, quorum sensing (QS) is prevalent in bacteria for coordinating their group behaviors such as bioluminescence , biofilm formation , pathogenesis  and antibiotic synthesis -. In Gram-negative bacteria, acyl-homoserine lactones (AHLs) are commonly used as QS molecules for intra-species communication. These molecules are composed of a homoserine lactone ring with an acyl chain of C4 to C18 in length ,. AHL molecules are synthesized by the LuxI family synthases and detected by the corresponding LuxR-type receptors . One canonical example of this class of communication is the QS system discovered in the bioluminescent marine bacterium Vibrio fischeri. As shown in Figure 1A, LuxI, the autoinducer synthase, produces the AHL molecule 3OC6HSL that can diffuse freely across the cell membrane and accumulate with the increase of cell density. Once the AHLs reach a threshold concentration, they form a complex with the LuxR receptor and activate the transcription of the downstream genes (luxI and luxR in this case). A positive feedback regulatory architecture arises here from the self-activation of LuxI synthesis to facilitate the synchronization of the cellular population. Similar to V. fischeri, many other Gram-negative bacteria also possess QS systems, including the LasI/LasR and RhlI/RhlR systems in Pseudomonas aeruginosa, the CarI/CarR system in Erwinia carotovora, and the EsaI/EsaR system in Pantoea stewartii. From an engineering perspective, these QS systems can be decomposed into two separate modules with one for signal production and the other for signal detection and response - when engineered in different cells, the two functional modules will confer communications between the two cells as shown in Figure 1C. Cellular communication in bacteria. (A) The LuxI/LuxR quorum sensing (QS) system in the Gram-negative bacterium Vibrio fischeri. The system consists of the genes luxI and luxR and the cognate promoter PluxI and PluxR. Its signaling molecule is the acyl-homoserine lactone (AHL) 3OC6HSL. (B) The Agr QS system in the Gram-positive bacterium Staphylococcus aureus. It consists of the genes, agrD, agrB, agrC, and agrA and the cognate promoter P2. The auto-inducing peptide (AIP) is the signaling molecule of the system. (C) An engineered communication module adapted from the wild-type LuxI/LuxR system in (A). By expressing luxI, the sender cell (left) produces the signal AHL that diffuses to the extracellular milieu and further into the receiver cell (right) to alter the expression of the downstream genes X. (D) A synthetic communication module built from the Agr system in (B). The sender cell (left) produces and secretes the signaling molecule AIP that is sensed by the receiver cell (right), resulting in the expression shift of the gene X in the receiver cell. In Gram-positive bacteria, modified oligopeptides often serve as the signaling molecules for cellular communication with the cooperation of two-component systems. One classic example of this type of system is the Agr system in Staphylococcus aureus (Figure 1B) . Here, the auto-inducing peptide (AIP) precursor, encoded by the gene agrD, is modified on its thiolactone ring and exported by AgrB protein. Upon the binding of AIP with the transmembrane protein AgrC, the transcriptional factor AgrA inside the cell is phosphorylated and then activated, which leads to the induction of the transcription of the downstream genes (agrB/D/C/A here). In addition to the Agr system, there are many communication systems based on auto-inducing peptides, such as the fsr system in Enterococcus faecalis, the Com system of Streptococcus pneumonia, and the nisRK system in Lactococcus. To program collective behaviors in Gram-positive bacteria, a modular partition of those AI systems can thus been exploited (Figure 1D). Other than the QS and AIP systems that are primarily present in intra-species communication, there are inter-species communication systems that coordinate cellular behaviors over multiple bacterial species. One such example is the communication systems mediated by the universal signaling molecule autoinducer-2 (AI-2), a furanosyl borate diester synthesized by LuxS from S-adenosylmethionine and present in roughly half of all sequenced bacterial genome ,. Towards programmable behaviors in multiple bacterial species, AI-2 is hence an ideal candidate for exploitation. The adoption of nonvolatile molecules, such as AHLs and AIs, as the broadcast signal enables cellular coordination across various species. However, communications via those molecules require the presence of the both sender and receiver species in the same liquid environments or in gel-like setting within a short distance to allow for diffusion of signaling molecules. Volatile molecules, in contrast, can diffuse through air and circumvent the need of physical mediating settings for signaling, allowing for more versatile, rapid, and large-scale communications of communities. Weber et al. recently established a communication system that utilizes acetaldehyde as signaling molecules . In their study, a bacterial strain (sender) was engineered to constitutively express alcohol dehydrogenase (ADH), an enzyme that converts ethanol in the medium to acetaldehyde. Due to its low boiling point (21°C), acetaldehyde volatized and was broadcast to neighboring cells (receiver) via air to trigger the expression of genes controlled by the cognate acetaldehyde-inducible promoters. Therefore, the sender cells produced a concentric gradient of acetaldehyde that induced the dose-dependent gene expression of the receiver cells with the expression level defined by the distance between the sender and receiver cells. In another example, Hasty and colleagues constructed ndh-2, a gene encoding NADH dehydrogenase II (membrane-bound respiratory enzyme), into an Escherichia coli strain to confer the production of hydrogen peroxide (H2O2) . H2O2 is a thermodynamically unstable chemical compound and is able to enter neighboring cells quickly to alter their redox state and inactivate ArcAB, resulting in the shift of the activity of the corresponding downstream genes. Through the exploitation of H2O2, a novel route of airborne signaling molecule was created for fast and large-scale colony coordination. In addition to the common signaling mechanisms discussed above, bacteria also exploit a wide range of alternative approaches for communications, such as quinolone signal , diffusible signal factor , cyclic dipeptide , diketopiperazines ,, and others ,. One such representative mode of signaling is the use of indole, an aromatic heterocyclic organic compound that is produced by over 85 species of Gram-positive and Gram-negative bacteria and used as an extracellular signal for global coordination of various bacterial species . 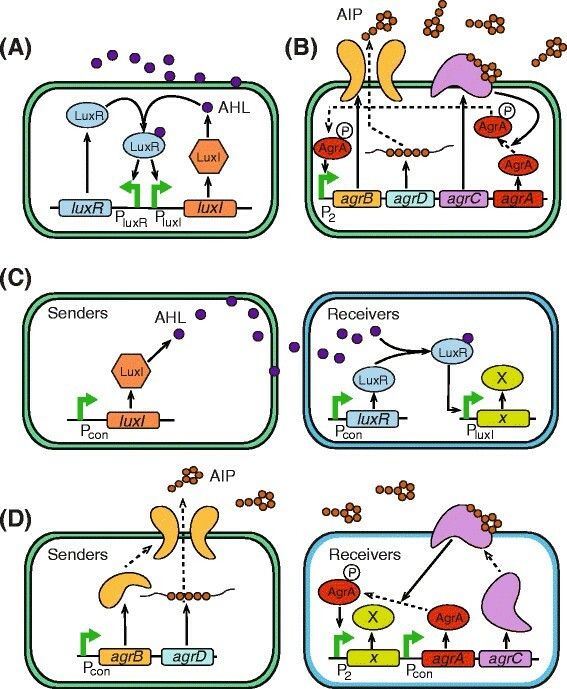 Although little of those mechanisms have been explored for synthetic biology applications, the broad spectrum of signaling systems provides a rich reservoir for engineering multicellular functionality. Cellular communications enable the coordination of single cells by sending and sensing the states of individuals. Inspired by this natural capability of bacteria, synthetic biologists have developed a set of engineered bacterial populations with their group behaviors programmed from designed artificial cell-cell communications. The first communication-based synthetic circuit was built by You et al. in 2004 with the goal of creating a dynamic, autonomous regulation of the cell density of an E. coli population . 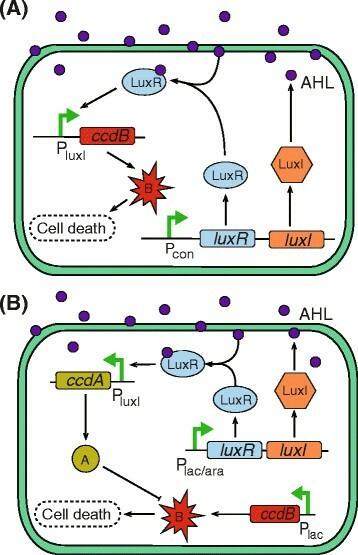 As illustrated in Figure 2A, the Lux system from V. fischeri was introduced to construct cell-cell communication and was coupled to cell survival and killing via the CcdA/B toxin system. Here, the LuxI protein catalyzes the synthesis of a small, diffusible AHL signaling molecule, 3OC6HSL, which accumulates in the extracellular milieu and the intracellular environment as the cell density increases. When cells reach a sufficient density, the AHL binds to LuxR and forms the LuxR/AHL complex that activates the expression of the killer protein LacZα-CcdB, leading to cell death. On the other hand, cell death can cause a reduction of total population density and hence the level of AHL production, which in turn allows the population to recover after killing. The continuous production and degradation of AHL make the cell density approach a steady state. Indeed, a stable cell density was maintained for more than 30 h with the variation within less than 5% in the study. This density control circuit laid a foundation for using cellular communications to program bacterial communities, allowing the extension of the control of population dynamics to the engineering of more sophisticated synthetic ecosystems. Cellular density control enabled by engineered cellular communications. (A) A communication-based gene circuit that confers the auto-regulation of cellular population density. In this system, a positive correlation between cell density and AHL concentration is essential and was created by having the cells constitutively produce LuxI that catalyzes AHL synthesis. At a low density, cells survive and grow normally because the expression of the toxin gene ccdB is not activated by a low AHL level. In contrast, when cell density achieves a critical level, ccdB expression is triggered by accumulated AHL, causing cellular death. The density-dependent cell death ensures an automatic control of total population density. (B) A synthetic gene circuit conferring an Allee effect in an isogenic population. Rather than the toxin CcdB in (A), the antitoxin CcdA was correlated with cellular density via AHL concentration. At a low cell density, the cells cannot survive because of their production of the toxin CcdB. At a high density, the production of the antitoxin CcdA is triggered to neutralize the toxic effects from CcdB, resulting in normal cell growth. In a recent work, Smith et al. utilized the density control circuit constructed above to create an artificial Allee effect in E. coli populations . The Allee effect is a biological phenomenon characterized by a correlation between population density and the mean individual fitness of a population . To create such an effect, a synthetic gene circuit was constructed to contain the LuxI/LuxR system and the CcdA/B toxin-antitoxin system (Figure 2B). In this setting, the expression of LuxR/LuxI and CcdB (killer) is under the control of Plac/ara promoter, while CcdA (rescue) was regulated by the cell density-dependent Plux promoter. When IPTG induction is on, the cellular population growth rate is negative if the initial cell density is less than the critical value (C crit) at which CcdA expression is not activated. However, if the initial cell density is above C crit, AHL activates the production of LuxR and further drives the production of CcdA which rescues the population by inhibiting the toxicity of CcdB. An Allee effect population was thus established to have a negative fitness below a threshold of cell density but a positive fitness when the density is beyond the threshold. This study provided new implications of engineered cellular communication for controlling invasive species and the spread of infectious diseases. Complex cellular behaviors, such as biofilm formation and host invasion, often require the temporal coordination and collective action of cellular populations ,. Towards this need, engineered communications offer a powerful solution. In a recent study, Hasty and colleagues reported the development of an artificial gene circuit that synchronizes the oscillation of gene expression in individual cells . Figure 3A shows their circuit design based on the QS elements of V. fischeri (luxI, luxR) and Bacillus thurigensis (aiiA). The AHL 3OC6HSL, synthesized by LuxI, binds to transcriptional factor LuxR to form a complex (LuxR-AHL) that activates the expression of luxI, which leads to a positive feedback loop in regulation. At the same time, the LuxR-AHL complex also activates the expression of aiiA, a gene encoding the AHL degradation enzyme, which leads to a negative feedback loop in regulation. The dual positive and negative feedback loops drive the sustained oscillation of gene expression of individual cells, and in the meantime, the signaling molecule AHL confers the synchronization of individual oscillations. Using a custom-tailored microfluidic device, the authors were, for the first time, able to establish and tune synchronized oscillations of an entire cellular population (thousands of cells). Compared with the single cell oscillators developed by the same group  and other researchers ,, the engineered cellular communication indeed conferred the synchrony of cellular gene expression dynamics at a robust and yet tunable fashion. Synchronization of genetic oscillations by communication-based circuits. (A) A QS-based gene circuit that synchronizes the oscillation of gene expression in an isogenic bacterial population. The oscillation is enabled by positive feedback, arising from the self-activation of AHL synthesis, and negative feedback, mediated by the AHL-degrading gene aiiA. The coupling of the two feedback loops results in robust oscillations of gene expression of an entire bacterial population (thousands of cells). (B) An advanced gene circuit modified from (A) that enables large-scale synchronization of oscillatory gene expression. In addition to the coupled positive and negative feedback in (A), an additional positive feedback loop is introduced by coupling the production of thermally unstable H2O2 by NADH dehydrogenase (ndh) with AHL biosynthesis, leading to global oscillation synchronization of millions of cells. Building on their success of the synchronized oscillator, the same group further advanced to create a more sophisticated genetic network that is capable of synchronizing oscillatory gene expression of populations across multiple spatial scales . As illustrated in Figure 3B, the researchers placed a copy of the ndh-2 gene, which encodes NADH dehydrogenase II, under the control of an additional copy of Plux promoter (compared with Figure 3A). The NDH-2 produces a low level of H2O2 that vapors and passes through the walls of the oxygen-permeable polydimethylsiloxane (PDMS) chips. Driven by the oscillation of gene expression mediated by the AHL-based synchronized oscillation circuit, H2O2 was periodically produced and exchanged between the cells within individual chambers. When entering cells, H2O2 changes the redox state of the cells and inactivates their lux promoter binding protein ArcAB, causing the global activation of the lux promoter of the cells in different chambers. As a result, thousands of oscillating colony ‘biopixels’ (approximately 2.5 million cells) were synchronized over centimeter-length scales through the use of synergistic intercellular coupling involving both quorum sensing within a colony and gas-phase redox signaling between colonies. As a proof-of-concept application, this system was further employed to sense arsenic in environments via differential modulations of the period of the oscillatory cells that resemble a liquid crystal display (LCD)-like macroscopic clock. One of the most fascinating aspects of biological systems is their ability to generate complex but highly reproducible organisms through differential spatial patterning of morphogens across isogenic cells . Towards the ultimate goal of biological engineering for creating desired tissues, organs, or even entire organisms, one critical step is to develop an engineering strategy that enables robust spatiotemporal pattern formation of living cells. Engineered cellular communications hold a great promise towards this goal, in addition to their roles in conferring temporal coordination of cellular behaviors. In fact, synthetic biologists have already made several interesting attempts through the exploitation of artificial communication-based gene circuits. For instance, Sohka et al. constructed a circuit implementing Wolpert's French flag model , enabling the determination of cell fates in a concentration-dependent manner ; Payne et al. created a circuit that allows self-organized pattern formation without morphogen gradients in bacteria ; Basu et al. engineered a band detector that allows for differential response of gene expression according to the local concentration of AHL, creating a bull's eye-like spatiotemporal pattern . One elegant example for this line of applications is the programming of bacterial stripe patterns by Liu and co-workers . As shown in Figure 4A, the gene circuit consists of two functional parts: density-sensing module and motility-control module. The density-sensing module centers on the LuxI/LuxR QS system that enables the synthesis and excretion of the AHL and the activation of the downstream gene cI when cell density is sufficiently high. The motility-control module is based on the bacterial motility system that is regulated by the transcription of cheZ. Upon the replacement of the wild-type cheZ with an inducible version (cheZ is under the control of the cI-repressed Plambda promoter), cellular motility becomes regulated by the expression of cI. With the coupling of the two modules, engineered E. coli populations were able to form robust but tunable periodic stripes of high and low cell densities sequentially and autonomously. These results established cellular motility as a simple route to create recurrent spatial structures without the need for an extrinsic pacemaker. As a novel mechanism, it offered an alternative solution for the formation of biological spatial patterns that is distinct from the well-acknowledged Turing mechanism . Spatial organization of cellular populations via engineered communication circuits. (A) A genetic circuit that generates periodic stripes in space. The LuxI/LuxR QS system is coupled to cellular motility via the transcriptional repressor gene cI, which is induced by AHL via the promoter PluxI and inhibits the expression of cheZ, one of the essential genes in bacteria motility. At a low cell density, AHL concentration remains low and no CI is produced, leading to a constant production of CheZ and hence a high cell motility. In a high cell density, sufficient accumulation of the AHL induces CI production which in turn suppresses cheZ expression, resulting in a deficiency in cell motility. The density-dependent motility of the population generates periodic stripe patterns in an expanding cell population. (B) A multi-module, communication-based synthetic circuit that allows accurate edge detection. Three functional modules are involved, including a light sensor, a cell communication module, and an X AND (NOT Y) gate. Upon exposure to red light, the light-sensing protein Cph8 induces the expression of cI and luxI: CI represses the expression of lacZ in the same cell regardless of AHL concentration while LuxI triggers the production of AHL that can diffuse to neighboring cells in the dark region to induce the production of LacZ. On the other hand, cells far from the light cannot produce LacZ because no AHL is available to trigger the transcription. As a result, only the cells near the edge of the light-exposed area actively express lacZ, which results in a dark pigment due to the enzymatic cleavage of a substrate in the plate by LacZ. In addition to autonomous pattern formation, the QS-based communication mechanism can also be applied to detect complex spatial signals. Tabor et al. recently developed a multi-module gene circuit system for edge detection, a signal processing algorithm common in artificial intelligence and image recognition . As illustrated in Figure 4B, the biological edge detection algorithm is composed of three modules: a dark sensor (NOT light), cell-cell communication cassette, and an X AND (NOT Y) genetic logic. The darker sensor was engineered based on the light-sensitive protein Cph8, a chimeric sensor kinase. With the covalent association of chromophore phycocyanobilin produced from heme via ho1 and pcyA ,, Cph8 is able to activate the ompC promoter (PompC) by transferring a phosphoryl group to the response regulator OmpR. However, in the presence of red light, the kinase activity of Cph8 is inhibited, which precludes the transcription from PompC and causes a NOT light transcriptional logic gate. The cell-cell communication was implemented through the Lux QS system and was used to convert light information into spatial distribution of AHL. With the incorporation of the converter cI and the hybrid promoter Plux-lambda, the state of PompC is converted via an X AND (NOT Y) logical operation into the state of the promoter Plux-lambda, which is displayed via the production of LacZ that produces black pigment. Upon the loading of the programs, a lawn of isogenic E. coli populations was able to sense an image of light, communicate to identify the light-dark edges, and visually present the result of the computation. Artificial cellular communications can enable not only the coordination of isogenic cell populations but also heterogeneous ecosystems that are composed of multiple species. You and co-works recently developed two gene circuits into a predator-prey ecosystem that consists of two E. coli populations . 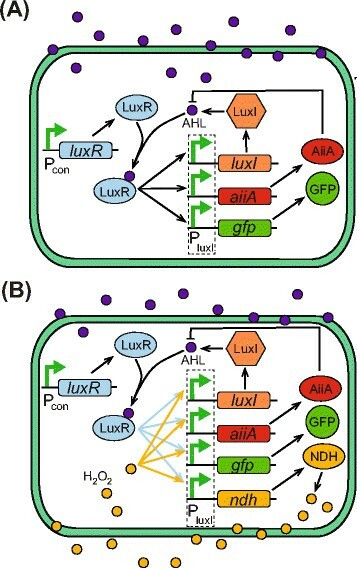 Figure 5A shows the design of the ecosystem that involves two QS modules, LuxI/LuxR from V. fischeri and LasI/LasR from P. aeruginosa, for two-way communications. The predator cell (top) produces and secretes the AHL 3OC12HSL that induces the expression of the toxin gene ccdB in the prey cell (bottom), leading to the death of the prey. In the meantime, the prey produces another AHL molecule, 3OC6HSL, which rescues the predator by inducing the production of antitoxin CcdA that neutralizes the toxin from CcdB. With appropriate modulations of the system parameters, the researchers were able to create a bacterial version of predation with different population dynamics generated, including extinction, coexistence, and oscillation. Similar to this work, another bidirectional intercellular communication network was also engineered by Brenner et al. , in which the LasI/LasR and RhlI/RhlR QS systems from P. aeruginosa were adopted to create a two-species microbial consensus consortium. In that ecosystem, the gene expression of any of the two species mutually depends on the presence of the other. Programmed ecosystems developed from designed cellular communications. (A) A synthetic predator-prey ecosystem in E. coli. The predator cell (top) produces the QS signal 3OC12HSL that induces the expression of the toxin gene ccdB in the prey cell (bottom) and causes cell death. Meanwhile, the prey produces another QS signal, 3OC6HSL, which triggers the expression of ccdA, an antitoxin gene whose expression rescues the predator by neutralizing the toxin CcdB accumulated inside the cell. (B) Synthetic ecosystems with E. coli and Chinese hamster ovary (CHO) cells. The three ecosystems were based on the same foundation - an airborne transmission of transcription system, through which the sender (E. coli) converts ethanol into volatile acetaldehyde and broadcasts it to the receiver (CHO-K1) to alter corresponding gene expression. Top panel: The volatile acetaldehyde produced by E. coli induces antibiotic resistance in CHO-K1 cells, leading to a commensal community. Middle panel: The acetaldehyde from the sender induces the apoptosis of the receiver, creating amensalism between the two species. Bottom panel: E. coli rescues the CHO-K1 cell by triggering antibiotic resistance through volatile acetaldehyde, and in the meantime, the CHO-K1 cell benefits E. coli by degrading ampicillin that is toxic to E. coli, resulting in a mutualistic consortium. (C) An engineered biofilm-forming system that consists of two communicating E. coli species. The disperser cell (bottom) produces AHL (3OC12HSL) to trigger the expression of the gene bdcAB50Q in the initial colonizer cell (top), leading to the dispersion of the biofilm formed by the initial colonizer cells. Meanwhile, the biofilm formed by the disperser cells can also be dispersed by inducing the expression of the dispersal protein Hha13D6 with external inducer IPTG. The combination of the two steps allows the replacement and removal of biofilms in a programmed manner. Beyond predation and consensus, designer cellular communications can be used to create a wide spectrum of inter-species interactions. As revealed by metagenomics and 16S pyrosequencing, microbial interactions in nature such as biofilms and the microbiome are extremely complicated and diverse - for instance, there can be parasitism, predation, commensalism, mutualism, competition, and amensalism within a single pair of species . As one of the earliest efforts towards the programming of complicated cellular consortia, Weber and Fussenegger developed a set of pairwise interactions between E. coli and Chinese hamster ovary (CHO) cells . As illustrated in Figure 5B, the designs of the ecosystems center on an airborne transmission of the transcription system that allows one species (E. coli) to convert ethanol into volatile acetaldehyde and broadcast this airborne signal (boiling point: 21°C) to another species (CHO-K1 cell line) for the activation of functionally specific, rationally engineered genes. The commensal ecosystem (top) was created by constructing an E. coli strain capable of converting ethanol into acetaldehyde for air broadcast and placing a neomycin resistance gene (neo) under the control of an acetaldehyde-induced promoter (Pair) in a CHO-K1 cell line. In addition, secreted alkaline phosphatase (SEAP) was used as a reporter of the CHO-K1 cells. When cultivated proximate to synthetic CHO-K1, the engineered E. coli cells confer survival of the mammalian cells while keeping their own growth unaffected by the mammalian cells cultured in a separate dish. The amensal ecosystem (middle) was synthesized by cultivating an acetaldehyde-broadcasting E. coli strain in close proximity to a CHO-K1 cell line that was engineered to have acetaldehyde-controlled expression of RipDD, a gene that encodes an apoptosis-inducing human receptor interacting protein. As a result, the CHO-K1 cells survive only in the absence of the E. coli cells because, otherwise, they induce the death of the CHO-K1 cells by producing acetaldehyde. To create a mutualistic interaction between E. coli and CHO-K1 cells (bottom), the commensal ecosystem developed earlier (top) was modified to incorporate a mammalian beta-lactamase gene sBLA under the control of the acetaldehyde-inducible promoter (Pair). Here, sBLA can be secreted to the extracellular milieu to hydrolyze the bacterial antibiotic ampicillin in the culture medium to promote the survival of co-cultured E. coli, resulting in bidirectional benefits between the two cell species. Following a similar idea, three additional types of ecosystem interactions were created, including parasitism, third party-inducible parasitism, and predator-prey interaction (not shown in Figure 5). This example demonstrated the ability of programming microbial consortia via rational design of cellular interactions by rewiring cellular communication systems, providing novel insights in understanding and programming microbial community patterns that orchestrate the complex coexistence of living systems. In addition to programming planktonic bacterial populations, synthetic communication circuits have also been exploited in controlling complex communities such as biofilms. Hong et al. recently developed quorum-sensing circuits to program the formation and dispersal of artificial E. coli biofilms . As shown in Figure 5C, the circuits have two functional parts with one belonging to the initial colonizer cell (top) and the other belonging to the disperser cell (bottom). The initial colonizer part consists of the constitutively expressed repressor gene lasR and its cognate promoter PlasI that drives the expression of the biofilm dispersion gene bdcAB50Q; the disperser part is composed of the AHL-producing gene lasI that is constitutively expressed and another biofilm dispersion gene, hha13D6, controlled by external inducer IPTG. Such a design allows the disperser cell to trigger the expression of the gene bdcAB50Q in the initial colonizer cell by producing AHL (3OC12HSL), leading to the dispersion and replacement of the biofilm formed by the initial colonizer cells. Meanwhile, the circuit in the disperser enables the biofilm formed by the dispersers to be removed with the external signal inducer IPTG. These types of functional circuits can be powerful in creating designer biofilms and enabling precise manipulation of community composition in the fields of biorefinery, medicine, and bioproduction. With the advances of synthetic biology technologies and a consensus on the need for community-based functionality engineering, synthetic microbial consortia have undergone a rapid development in the past few years. This review has surveyed recent advances of engineered biological systems that utilize cell-cell communication to program bacterial group behaviors, covering both the basic communication modules and functional gene circuits that confer desired community-based dynamic behaviors. Although there has been significant progress, the engineering of microbial communities is still in its infancy and is subject to a set of challenges. In fact, almost all synthetic circuits to date have involved many rounds of trial and error before achieving the desired functionality. Difficulties in the efficient construction of engineered circuits often stem from a lack of biological knowledge. Specifically, to facilitate gene circuit engineering, it is needed to have a deep understanding of stochasticity in gene expression -, the inherent interplay between a synthetic circuit and the host organism , and issues related to multicellular physiology and metabolism . Another big challenge arises from the technical side of synthetic biology, which includes the lack of powerful rational design platforms, limited availability of parts and modules, efficient systematic optimization strategies and toolkits, and high-throughput assays for circuit validation. Addressing the above challenges will foster our engineering capability and help to achieve the ultimate goal of efficient and reliable development of synthetic circuits with defined functionality. Despite the challenges, the future of engineered microbial communities is bright. In fact, synthetic consortia have already started to show tremendous potential in both understanding biological questions and addressing real-world concerns. For example, extended from the programming of cellular dynamics, synthetic bacterial systems have been applied to understand ecological and evolutionary questions that are difficult to address with natural communities . Towards real-world applications, bacterial consortia synthesized with designer communication modules have been used for information processing ,, bio-computation , and therapeutics -, as well as material and chemical productions -. There are a variety of research fields where synthetic bacterial consortia have started to play an important role: In metabolic engineering, cellular communication can be used to implement self-regulated control between cellular growth and product manufacturing in bioreactors for autonomous bioproduction. In biomedical applications, custom-tailored probiotic bacteria can be introduced into the human body to alter the composition and hence the function of the gut microbiota for disease treatment. In areas relating to the environment, biofilms and microbial consortia in soil and other natural settings can be perturbed and even reprogrammed with engineered microbes for desired purposes. We thus expect that microbial communities programmed via engineered cellular communication will become a versatile strategy in addressing both scientific and practical challenges in the near future. We thank Andrew Blanchard for commenting and editing the manuscript. This work was supported by the American Heart Association (Grant No. 12SDG12090025), the Network for Computational Nanotechnology at UIUC sponsored by National Science Foundation (Grant No. 1227034), and the UIUC Research Board. QH and TL conceived the study and designed the project. WT, VC, and TL drafted the manuscript. CL analyzed the data. All authors read and approved the final manuscript.